The idea of vacation itself is enough to help us begin to unwind. The fact that you are leaving, detaching from your regular life and daily routines – delicious! Yes, the physicality of removing yourself can be enough at first, but actually, it’s how you spend your time on vacation that is critical to unwinding – I mean really unwinding and unloading your mind. My mini-vacay to Florida this week served me well in unloading mental stress and refocusing on being mentally clear. I think I was pretty successful at achieving what I went there for. 1. Go somewhere that forces you to relax. Choose carefully and think about the purpose of your trip (which is probably de-stressing, decompressing, de-elevating, unwinding, searching for mental clarity). Going somewhere that offers tons of activities will keep you too busy. Go to those places when you don’t need to de-stress. Many times people return from vacation saying they need a vacation from the vacation they were just on. *Note: If you are not able to actually go away-away – by plane, train or car – then find a “redemption place” that is your mental clarity spot. A place you can visit daily if possible. 2. Choose the right amount of time to be away. If you are not away long enough, you will not allow yourself to truly relax. 3. Physically detach from people! Don’t talk to anyone. Seriously, unless you have to. Talking is a really exhausting exercise. 4. Read books unrelated to your job. And read books you’ve had on your shelf for a long time. Let your mind go. Escape into whatever you choose to read. 5. Have a glass or wine, beer, or cocktail a day. One or two – and really enjoy the taste. Enjoy the moments attached – sitting, sipping, not talking, not checking your phone – just being in the moment. 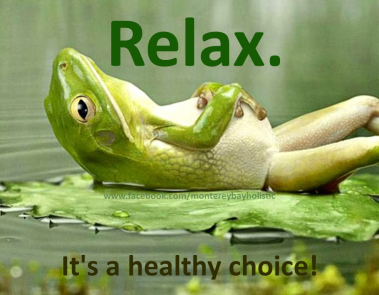 Allow yourself to relax with your alcohol instead of getting drunk with it. No hangover this way! 6. Sit. Observe. Try not to judge, but instead, just enjoy watching people. Make up stories about them in your head. Make yourself laugh. 7. Realize when you are ready to participate in interaction again, and do so meaningfully. Say something nice to someone. Offer help. Give up your seat. Pay attention. Marvel. Savor. This is why you left in the first place. To regain your clarity. You can do this at home if you can seclude yourself a little!